Doboy Model Stratus, 2-up, horizontal, hand load wrapper rated from 20 to 100 packages per minute – depending on materials, application and operator dexterity. Product size range: 2" to 8" in Length; 1/2" to 6-1/4" in Width; up to 2-1/4" in Height with (proper change parts). Equipped with 80" long lugged product in feed conveyor with pop out lugs and 48" product hand load area, 7" wide x 3/4" thick serrated knife seal jaws, fin seal wheel, film registration and safety guarding. Web specs: to 18-1/2" in width; Max roll 16" in diameter; with 3" diameter core. Mounted on base frame with height adjustable legs and casters. Doboy Model JSL, semi auto, paper card header, label applicator and bag sealer rated from 5 to 30 bags per minute – depending on materials, application and operator dexterity. Header size range: 2-1/2" to 9-1/2" in Width; 1-1/4" to 6" in Height. Equipped with adjustable 12" long x 9" wide header magazine, with recipicating pic n place, 10" wide x 2-1/2" thick seal jaw with 1/2" diameter center top hole punch. Control panel with temperature heat controller, run / jog and heat on / off switches, with start and e-stop buttons and is mounted on hand crank height adjustable stand with casters. Designed to heat seal bags depending on material and apply header card labels to the top of a pre-made, pre-filled cello, coated cello, polyethylene, saran, and other heat seal material bags. Label widths and folds are adjustable to fit a wide range of bag packaging needs. Doboy Mustang IV, Horizontal wrapper rated from 15 to 150 ppm – depending on materials and application. Size range: 3" to 18" in length; 1/2" to 7" W; 1/16" to 2" in height. Equipped with 10′ lugged in-feed, two up 7" wide seal jaws, film registration, digital pause/length adjustment for fast repeatable changeover. Additionally features a PTO line shaft. OAD: 180"L x 45"W x 84"H.
Roll stock card feeder & Markem coder available for an additional cost. Doboy Stratus, 2-up, horizontal wrapper. Package size range: 3" to 7-1/4" in Length (2 up configuration); 4" to 14.75" (1 up configuration); 1/2" to 7" in Width; up to 2-1/4” in Height. Equipped with 84" long lugged in feed, 1" high plastic lugs, 2-up seal jaw, registration, safety guarding and discharge conveyor. Film specifications: up to 18-1/2" in width; up to 16" in diameter; 3" core. Touch pad controls. Mounted on locking casters. Speed dependant on materials, application and machine configuration. Markem Image thermo date coder available at addition cost. Doboy Model CBSCH, automatic, right to left, continuous, chain fed, band sealer rated from 0" to 425" per minute with number of bags – depending on materials, application and machine configuration. Equipped with angled and tilt away sealing head with (2) sets of 3/8" wide heat sealing bars and (1) air cooling bar. Control panel has heater 1 and heater 2 temperature controllers, on / off heat switch with start / stop push button controls. Mounted on hand crank height adjustable base frame designed to go over existing conveyor. Doboy, card sheeter, roll fed, flat board. Rated from 80 to 200 cards per minute – depending on materials and application. Card size range: 3" to 5½" in Length ; 3" to 8" in Width. Equipped with film on/off switch, perforation on/off switch, E-stop and maximum 9" wide roll stock with 6" core with 28" maximum roll diameter. 9¾" long drive rollers and card cutoff. Sequence of operation card stock is pulled from supply roll and thru drive rollers that push the card stock into the cutoff where it is cut into the smaller pieces and deposited onto the wrapper infeed conveyor prior to product to be wrapped. Doboy Model Scotty II, semi automatic, horizontal wrapper rated from 10 to 60 packages per minute – depending on materials, application and operator dexterity. Product size: 4" to 12" in Length; 1" to 7" in Width; to 2-3/4" in Height standard. Equipped with 48" long stainless steel lugged carrier chain in feed conveyor, 1-up 7" x 1" wide hot knife cross seal jaw and single fin seal wheel. Control panel has jog / run on / off switches, end and fin seal temperature controllers. Mounted on base frame with casters. Maximum film diameter of 14" and maximum web width up to 20". 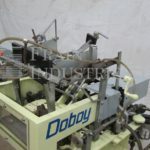 Doboy Mustang IV, Automatic, 2-up, horizontal wrapper rated from 60 to 150 packages per minute – depending on materials and application. Package size range: 3" to 18" in Length; 1/2" to 7" in Width; 1/16" to 3 3/4" in Height. Equipped with a 108" long two belt and one vacuum, servo, infeed conveyors with adjustable guide rails, 64" long carrier chain, film registration, forming station, three set of fin wheels two pulling one sealing, 7.5" wide 2-up cross seal, stainless steel safety guarding, push button controls, and a 30" long discharge conveyor. Film specifications: up to 24" in Width; up to 16" in Diameter, 3" core. Mechanical Gusset attachment available at additional cost. Continuous band sealer rated up to 425" per minute – depending on materials and application. Seal width: 3/8". Equipped with two sets of heating bars, one set of water chilled cooling bars, recirculation water chiller, variable speed / temperature controls. Mounted on a hand crank adjustable frame with casters. Continuous band sealer rated up to 425" per minute – depending on materials and application. Seal width: 3/8". Equipped with two sets of heating bars, one set of water chilled cooling bars, recirculating water chiller, and variable speed / temperature controls. Mounted on a hand crank adjustable frame with casters.